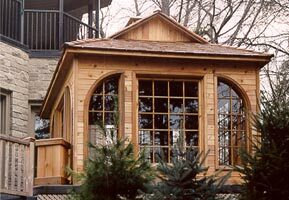 Although usually specified for spa, hot tub and sauna enclosures, all-cedar construction is available in any of our designs and may be used in any application where the beauty and aromatic scent of natural cedar wood is desired. With their sturdy construction and use of quality materials, extensive pre-fabrication, ease of assembly, and attractive design, their possible uses are only limited by your imagination. The installation of a spa, hot tub or sauna is a major investment in your home so the importance of choosing the right spa enclosure cannot be denied. Our pre-fabricated kits make the job easy, unlike many other home improvement projects which can prove to be quite difficult. Sites such as Home Advisor can offer assistance with home improvement projects as well as creative decor and repair ideas. Click on any of the pictures in the filmstrip to see more pictures, details and pricing on the pictured spa enclosure, or use the models listed in the design center as a starting point for your own spa enclosure kit design. and a meticulously finished interior. 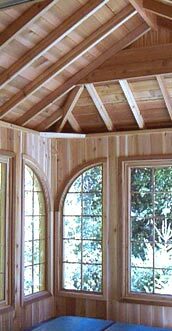 Use this design center as a starting point to design and price your own all-cedar designs with finished interiors. Watch our design center instructional video and you'll be designing your custom spa enclosure in less than 5 minutes!